Molleshree “Molly” Karna, a senior biomedical engineering major, has won a 2015-2016 Fulbright U.S. Student Award to support a year of research among impoverished women in Mumbai. In collaboration with India’s renowned Tata Institute of Social Sciences, she will work to identify and correct factors contributing to low birth weight in infants born into disadvantaged circumstances. Karna was motivated by the poverty she witnessed on family trips to India and by research she conducted at the Army Research Laboratory while in high school. She came to Columbia Engineering to develop analytical expertise in biomedical engineering while exploring multidisciplinary possibilities involving fields like film and public health. 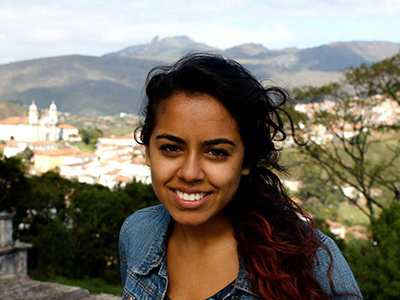 An avid traveler with a taste for new environments and cultures, Karna has visited many countries across South America, Asia, and Europe, and developed a broad and nuanced perspective on how best to address poverty and public health in widely divergent contexts. In her studies and in internships with the National Cancer Institute’s Laboratory for Cellular Oncology and at the Universidade Federal de Minas Gerais in Brazil, she has worked to apply engineering techniques and technologies such as quantum dots, biosensors, and synthetic peptides to such public health challenges as alcoholism and limited access to health care. And, having served as a legislative intern for Maryland Senator Barbara Mikulski charged with researching the Affordable Care Act, Karna has learned how change is made in the political and policy spheres. When her Fulbright concludes, Karna plans on entering consulting with an eye to understanding how a range of industries intersect with various governments in both the developed and developing worlds. Further down the road, she hopes to pursue a graduate degree in global health and public policy and eventually help shape public health policy both in the United States and abroad. Karna expressed appreciation for the education she received at SEAS, in particular learning from Aaron Kyle, senior lecturer in biomedical engineering, and her experience working on a senior design project to develop an accessory that will prevent leakage from ostomy bag systems.